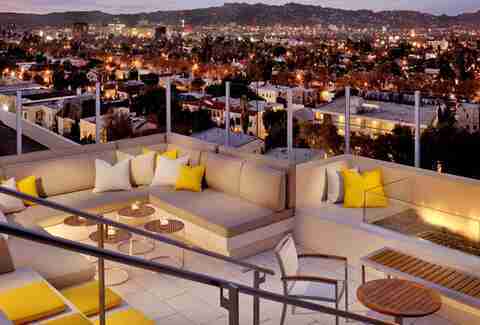 There’s a special feeling you get at every great Los Angeles rooftop. After taking an elevator (or the stairs) all the way up to the deck, you experience a revelation: a view of the city you’ve never seen unfolds before you, courtesy of a previously unknown vantage point. 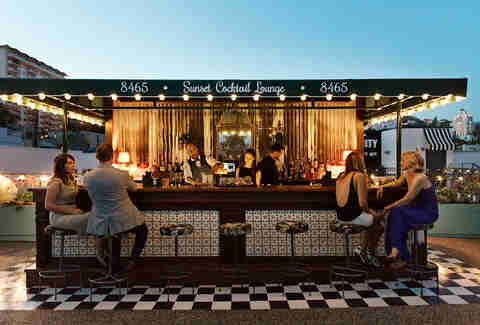 That feeling of discovery is, of course, made even better when it’s abetted by great drinks, or great food, or... tennis? 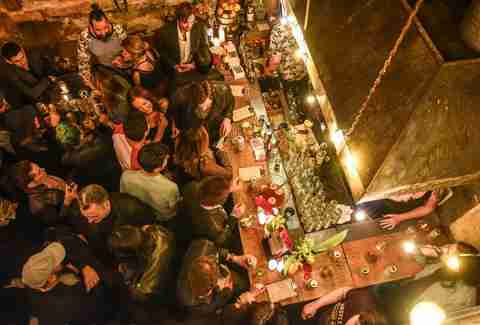 Whether you’re lookin to turn up after work or simply relax in style, you’ve got plenty of options -- which is why we’ve gathered the choicest hangouts into one handy guide. 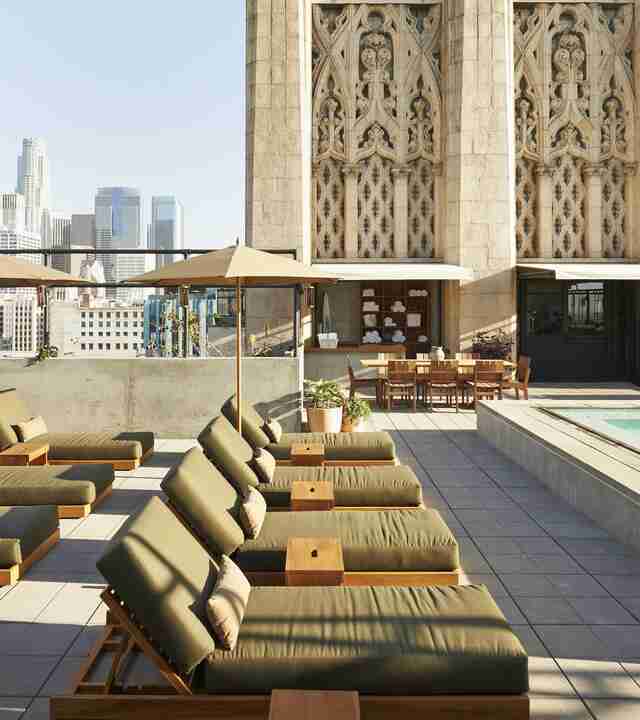 Start enjoying LA’s vertical side at the coolest rooftop retreats in the city. 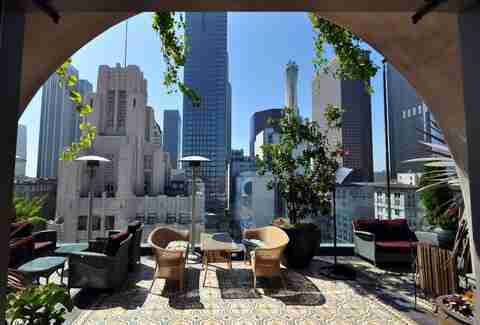 At the top of the Freehand Hotel sits Broken Shaker, the type of rooftop spot that LA desperately needs more of. 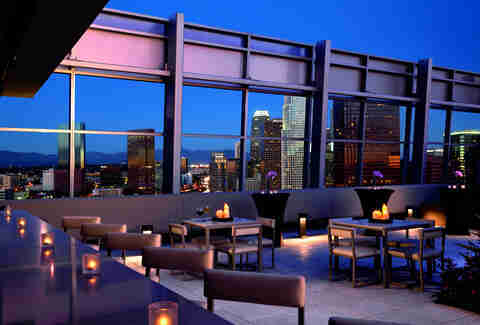 Bright, colorful, and buzzy, Broken Shaker is rocking some of the best DTLA views of any rooftop in the area. The cocktail and bites menus are no joke either -- think beachside fish shack vibes. Protip: They’re open during the daytime, too. The Nomad Hotel rocked LA as one of 2018’s biggest openings, and between the lobby and mezzanine restaurants, you probably thought that was all they had to offer. Wrong. 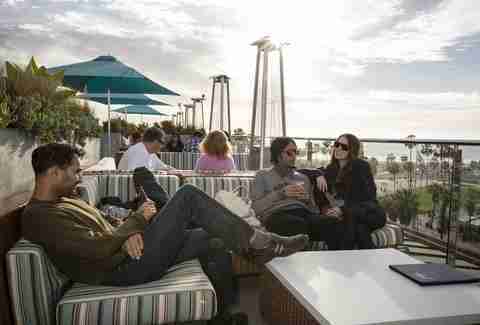 The newly opened rooftop bar is wonderful, featuring a menu full of Nomad-quality stuff; all the cocktails, beers, wines, and frozen drinks you could ask for are available, as well as tasty bites (shout-out to those scallops), and there’s even a whole section of non-alcoholic cocktails. Fun for the whole family! If you’ve been in LA for even one second, you’ve heard somebody rejoicing that we finally got an Eataly. It hasn’t disappointed, despite being located in the Century City Westfield Mall (it’s honestly shocking how much great stuff is in there now), and the new rooftop is no exception. Drinks are a no-brainer, but if you’re hungry there’s also a full-service lunch & dinner restaurant. There are rooftops, and then there’s Spire 73. This open-air hotspot is, you guessed it, 73 stories in the air, and an absolute titan of the DTLA scene. Clocking in at over 1,000ft, the Wilshire Grand Center is the tallest building west of the Mississippi (seriously), and that makes Spire 73 -- part of the building's InterContinental Los Angeles Downtown hotel -- the highest place to grab a drink in LA. The views are breathtaking (literally -- you’re 73 stories up), and there isn’t a single piece of LA you can’t see. 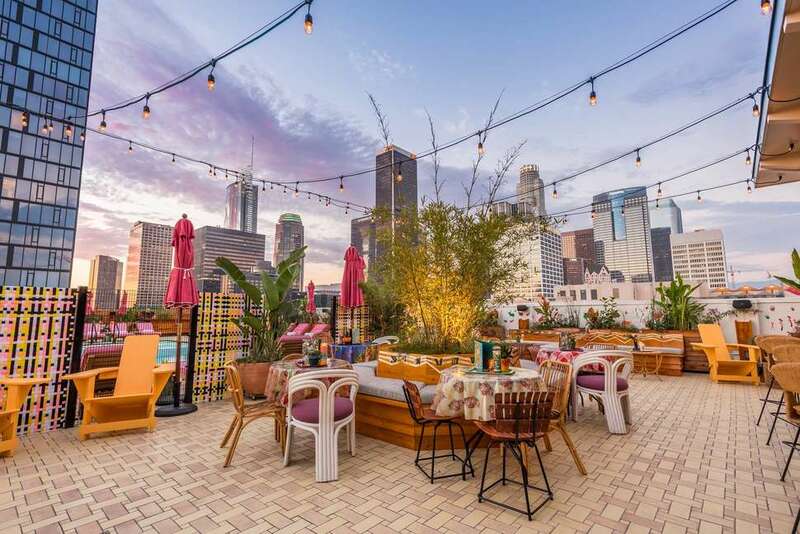 This longtime local favorite rooftop somehow still feels like a hidden treasure: the pool is beautiful, the food at its classic-American restaurant is delicious, the garden calming, and the bars (there are two) thirst quenching. If you're looking to dine on the roof, note that you'll have to reserve a room first -- actually, maybe that's why this treasure feels so hidden? The prime Downtown rooftop of Wolfgang Puck’s restaurant atop the Ritz-Carlton is usually closed to the public -- except for this summer, when on Friday and Saturday nights it’ll be open for a revolving door of food concepts, including ramen, American BBQ, Korean BBQ, and an ongoing dessert bar. Since the hotel’s opening in 2014, the Upstairs bar at Ace has become an unquestionable classic in the rooftop game, thanks to a roaring fireplace, a killer view of that iconic "Jesus Saves" sign, amazing drinks, a pool (albeit a weirdly small one), and DJs and performances nearly nightly. It’s also a perfect place to stop before a show (and after a show) at Ace’s Theater. 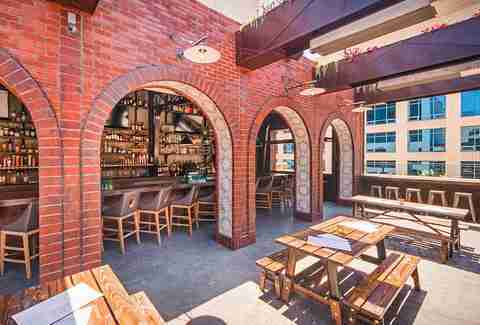 This airy patio on Sunset is right in the heart of tourist-central, but still delivers great drinks and food -- a rarity to find on the Strip, and an even bigger rarity overlooking the Strip. You'd never know this rooftop bar was here if you didn't, uh, know this rooftop bar was here, which is just one of the many reasons it's great: carefully-curated, fresh ingredient-filled drinks are another. Anyone can das boot on the lower level, but grab a drink upstairs at the Red Lion to feel like you’re really in the middle of Berlin (and grab one of the monster-size pretzels for extra authenticity). Oh and just because it’s not that high off the ground doesn’t mean it’s not a rooftop. You know what's better than seeing a show inside the Fonda? Watching the live feed of the show from ON TOP OF THE FONDA while drinking a cold drink. Boom. We said it. Yellowtail ceviche. Korean BBQ sliders. Chili/garlic/furikake wings. A view of the ocean. Wait, sorry, what were we talking about? Okay, this one stretches the rooftop definition a little, but its top-of-the-mountain view of the city + great pool + model-y ambience is probably what people from the Midwest think of when they picture LA. Grab some of the house-made harissa hummus or some seafood flatbread, and think about all the poor unfortunate souls who aren’t you. Yeah, this Downtown restaurant's got one of the best views in the city, but did you know one floor above is a bar with EVEN BETTER-ER VIEWS IN THE CITY? And the drinks are so good, you guys. Try a Spicy Concombre w/ Greenalls gin, St. Germain, lime juice, cucumber, and jalapeño. Alternatively, you can grab yourself a $6 Scrimshaw, or a $7 Stone IPA. And psst, they’ve even got a late-night menu, including ahi tuna tartar and burgers. Oysters, Sriracha butter chicken wings, 50 craft beers on tap, ping pong, board games, picnic tables, and live music. Any questions? The sushi here is kinda, sorta, a little bit, pretty good -- and the 21st-floor view is next level. Add the club Elevate next door for post-dinner drinks, and, yeah, winner. Winner. Waterbeds. DJs. A biergarten. Actually good food. Bikinis. You. Yes. 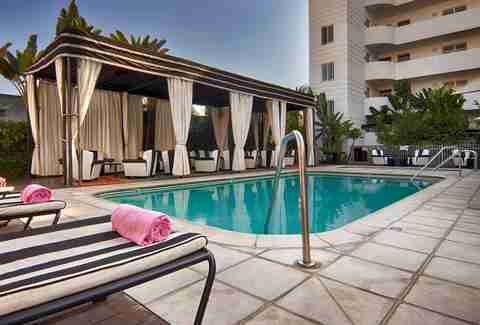 It looks like a nondescript office building on the outside, but the Hotel Wilshire is actually a great boutique hotel on an otherwise non-hotel-y part of, uh, Wilshire that's equipped with a fantastic rooftop bar and a killer view of the Hollywood Hills. 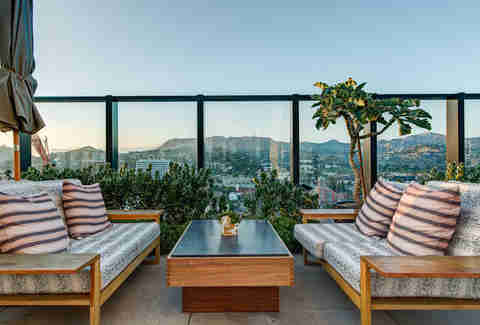 Take the less than 10min walk from Abbot Kinney and peep Hotel Erwin’s rooftop bar (assuming you haven't already while you were completing the LA bucket list). The sea breeze goes great with one of the craft cocktails or some mahi-mahi tacos. Easy street parking and nutso sunsets are also a major plus. Eating and drinking don’t have to be your only rooftop activities this summer (but they could be!). If you’re done unleashing your inner Jeremy Piven and want to unleash your inner Serena Williams instead, head over to the West Hollywood Tennis courts and check out the beautifully-maintained courts on the roof of the parking structure. Eating and drinking and playing tennis also don't have to be your only rooftop activities this summer (but again, they could be!). Once you're done unleashing your inner Serena, unleash your inner Tiger Woods (minus, you know, the cheating) at this rooftop driving range, which has an automated ball-teeing system and is open 'til 10pm. 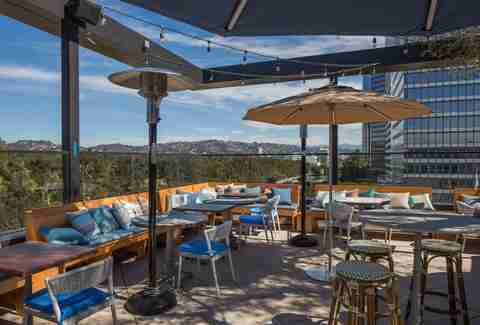 A brand-new, elite-level day-drinking option on the rooftop of the Hollywood Proper, Filifera is here to combat the woeful lack of great rooftops in LA. Grab some upscale cocktails, upscale snacks, and bask in the glorious sunshine that brought you there in the first place. By the way, if you’re wondering what a filifera is, you’d know it better as the desert fan palm tree. Wilder Shaw is a regular Thrillist contributor who truly has no business ever being on the ground. Check his altitude on Twitter and Instagram. Jeff Miller writes for Thrillist. Follow him on Instagram.